Fresh Fiction is a book review and entertainment website which also offers a monthly book subscription service. Every month, subscribers will receive one of these bright pink boxes which will contain 3-5 actual books, as well as download cards for 2-3 ebooks. Everyone receives a different selection of books, and there’s a variety of genres. Shown above is a pic of the goodies I received in the October box, and below is a description of each. Clicking on the title will take you directly to the Amazon page in case you feel the urge to add to your TBR. 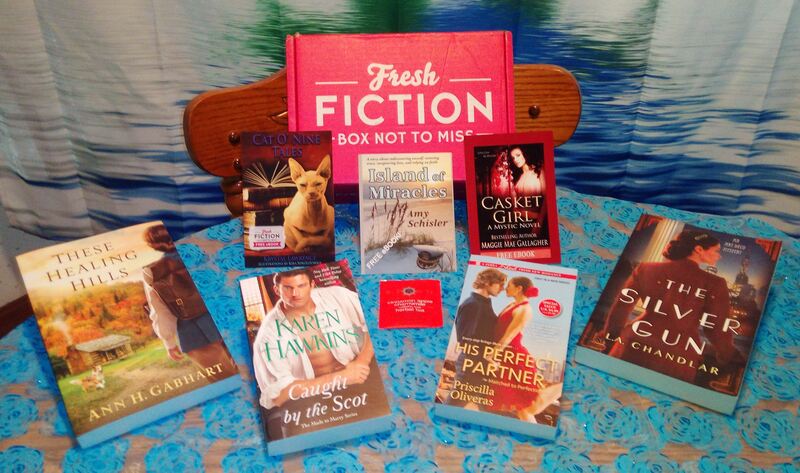 Click here –>> Fresh Fiction Box for all the details and costs of the monthly subscription. Fresh Fiction does ship world wide. His Perfect Partner (Matched to Perfection) by Priscilla Oliveras – Ad executive Tomas Garcia shouldn’t even be thinking about his daughter’s alluring dance teacher, Yazmine Fernandez. Burned by a shattering divorce, he’s laser-focused on his career and giving his young daughter, Maria, the secure home she deserves. Plus, he’s certain that with her talent, Yaz will be leaving Chicago and heading back to Broadway as soon as she can. But Yaz’s generous spirit and caring concern are sparking a desire Tomas can’t resist and doesn’t want to let go . . .
For Yaz, good-looking workaholics like Tomas simply can’t be part of her life ever again. She owes it to herself to get back her confidence and fulfill the dreams her papa could not. She’s glad to spend time with Maria and taste the family life she feels she can never have. And she’s sure that she and Tomas can keep their attraction under control because there’s so much at stake. But each unexpected intimacy, each self-revelation, makes the fire between them grow hotter with every step and every risk to their hearts . . . Caught by the Scot (Made to Marry Book 1) by Karen Hawkins – When the dark Duke of Hamilton loses his beloved wife, he heeds her dying wish that he make certain her three brothers marry well for she fears they are all headed to ruin. Heartsick, the Duke approaches the task with a heavy hand, ordering the three brothers to marry within three months or forego their inheritance. The middle brother, the dashing Conner Douglas, is not about to give up his independence, but he knows marriage doesn’t always mean one must change, does it? If anything, being married to a pliable sort of female would give him even more opportunity to seduce the married women of the ton. So he heads straight for the most pliable female he knows – a childhood acquaintance and now mousy spinster, the English born and bred Miss Theodora Cumberbatch-Snowe. Conner is so certain Theodora will joyously agree to marry him, that he takes his time traveling to her house and has only one month to secure her hand and marry. Yet when he arrives at her parents’ house he discovers that Theodora has just run away with a local landowner—a farmer, no less! Unknown to Conner, Theodora has been wildly, passionately in love with him for years. But she’s accepted that he sees her only as a friend. Unable to sit forever in her parents’ front parlor and wait for what will never happen, Theodora decided to marry someone comfortable in the hopes they might at least become good partners. Unaware of Theodora’s feelings, Conner isn’t about to let ‘the perfect wife’ get away so easily. But as Conner seduces Theodora, his own feelings stir. And after surviving a trip of mishaps and traps, he discovers that he can’t image her marrying anyone but him. The Silver Gun (An Art Deco Mystery) by L.A. Chandlar – New York City, 1936. In the midst of the Great Depression, the Big Apple is defiantly striving toward an era infused with art, architecture, and economic progress under the dynamic Mayor La Guardia. But those in City Hall know that tumultuous times can inspire both optimism and deadly danger . . . It s been six months since Lane Sanders was appointed Mayor Fiorella Fio La Guardia s new personal aide, and the twenty-three-year-old is sprinting in her Mary Janes to match her boss s pace. Despite dealing with vitriol from the Tammany Hall political machine and managing endless revitalization efforts, Fio hasn t slowed down a bit during his years in office. And luckily for Lane, his unpredictable antics are a welcome distraction from the childhood memories that haunt her dreams and the silver gun she ll never forget. When Lane gets attacked and threatened by an assailant tied to one of most notorious gangsters in the city, even the mayor can t promise her safety. The corrupt city officials seem to be using Lane as a pawn against Fio for disgracing their party in the prior election. But why was the assailant wielding the exact same gun from her nightmares? Balancing a clandestine love affair and a mounting list of suspects, Lane must figure out how the secrets of her past are connected to the city s underground crime network before someone pulls the trigger on the most explosive revenge plot in New York history . . . These Healing Hills by Ann Gabhart – Francine Howard has her life all mapped out until the soldier she planned to marry at WWII’s end writes to tell her he’s in love with a woman in England. Devastated, Francine seeks a fresh start in the Appalachian Mountains, training to be a nurse midwife for the Frontier Nursing Service. Cat O’ Nine Tales by Krystal Lawrence – What evil dwells within the pretty lady next door or the ordinary house cat? Island of Miracles by Amy Schisler – Katherine Middleton leads a charmed life in her million dollar Georgetown Brownstone. The daughter of a world-renown anthropologist, she is happily married and employed by the Smithsonian when her world comes crashing down after the discovery of her husband’s secret life. An impulsive decision to hide out on Virginia’s Eastern Shore, in order to re-evaluate her own life, leads Kate to earth-shattering revelations about herself, her family, and her future. Chincoteague Island, Virginia, introduces Kate to a world where people can still rely on each other, where hard work pays off, and where one’s past does not dictate the future. Island of Miracles is a story about rediscovering oneself, restoring trust, recapturing love, and relying on faith. Casket Girl: A Mystic Novel (The Mystic Series Book 2) by Maggie Mae Gallagher – All he wants is to find a killer… FBI Special Agent Josh Blake has seen some bizarre cases in his day. His latest case is one for the record books. He has multiple homicides, corpses drained of every ounce of blood, and no suspects. When rumors surface that the French Quarter may be hiding an insidious monster bent on drenching the streets in dead bodies, he must suspend logic and place his trust in the mystical. She wants a fresh start… Isabelle Toussant left her family home in the bayou five year ago, cutting all ties with her abusive whiskey swilling stepfather, to forge a new life in the French Quarter. Now a successful business owner of Madam Toussant’s Mystical Gifts in Jackson Square, and a Seer with voodoo roots. The foundation of her new life shatters when one of her employee’s winds up dead and she is dragged into a deadly game where she becomes the target of a serial killer. A passion neither expected… Determined to stop the brutal slayings, Josh must rely on the beautiful Isabelle who makes him question everything he has ever known about life and death all while surrendering to a desire hotter than a Bayou night. When Isabelle disappears without a trace, with tourists flocking to the party capital for Halloween, and the body count continues to mount, Josh will be forced to push beyond the boundaries of what he thinks is possible and rescue the woman he loves before it’s too late. Please also be sure to check out Fresh Fiction for excellent book reviews, author interviews, and entertainment information. Loved the box you sent this month. Great reads. Thank you! Hi, Jo Ann. Fresh Fiction does a great job with the book subscriptions. Thanks for visiting the blog and glad you are enjoying the books!